Pre purchase building and pest inspections and termite inspections what we like to see. Termites Inspection Zone concrete slab on ground. The Building code states Requires an inspection zone of 75mm to be provided around perimeter of the dwelling. This inspection zone is for the purpose of termite inspections . So the inspection zone must be 75mm. Firstly , As you can see in the picture below that the inspection zone is clear from the weep hole to the ground this allows us as inspectors to see any termite activity that maybe entering the home. Furthermore you must not obstruct this area with gardens , water tanks , pathways or even garden sheds as this can allow termites to get in undetected. So you ask why is this important? Pre purchase Building and pest Inspections. It is very important because all homes now must have a physical termite system installed. Which stops termites entering the home from under the slab . So termites can only enter the home from the outside and must go over the Termites inspection zone. The picture below shows the termites inspection zone obstructed and the weep hole partially obstructed. So this is perfect for termites to enter without you knowing. These obstructions we find in most pre purchase building and pest inspections . So our recommendation is a external chemical barrier to be installed or secondly to reduce ground levels to expose the inspection zone and slab edge. The second option is not an option for most people as this will cost a small fortune to remove all the pathways and reduce the ground levels then re install the pathways. In this Video it shows a almost perfect Inspection zone. You would definitely see termites entering this home. 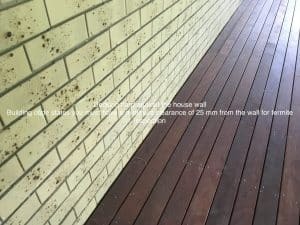 Any timber structures such as decking are required to be 25mm off the house wall so you can inspect for termites breaching. The picture below shows decking hard up against the house. This obstructs the termite inspection zone and can allow undetected termite entry. Pre purchase building and pest inspections and what we like to see. 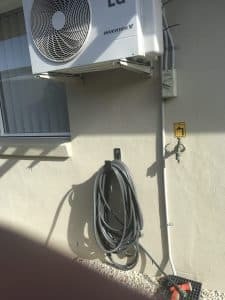 Air Conditioner and Hot water service overflows. The first picture below shows what we like to see overflows draining into the drainage system keeping the external walls of the house free of moisture. In fact if you keep the external areas around your house dry termites won't be attracted to your home. 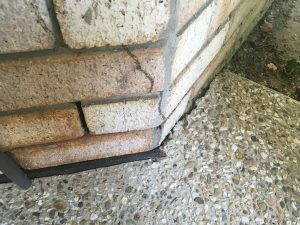 During the inspection we look for moisture sources and we like to see no leaking tapes or overflows draining adjacent to the house. Moisture is the number one thing around your home that attracts termites. It doesn't matter what type of construction you must keep moisture away. So keep your house dry and well ventilated and termites wont come looking. 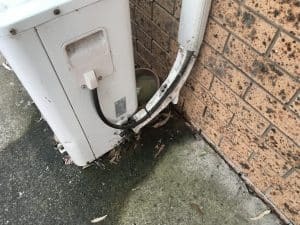 The two pictures below show what we find in most Pre purchase building and pest inspections overflows not connected to the drainage system. Overflow draining adjacent to the house creating moisture. Hot water service overflow drain adjacent to the house. As you can see below this water tank has the overflow connected to the drainage and is off the wall to not obstruct the inspection zone. We find most termite attacks happen because of moisture found in these areas. Water tank overflow connected to the drainage and a gap between the wall and tank for inspecting. Gardens are a major problem when they are next to the house . They not only obstruct the inspection zone and weep holes they retain moisture especially when you have mulch as well. Termites absolutely love these conditions and you are inviting them into your home so we always recommend gardens be removed and if you don't just make sure they are well maintained and the inspection zone is clear so if any termites start tracking into your home they will be visible. 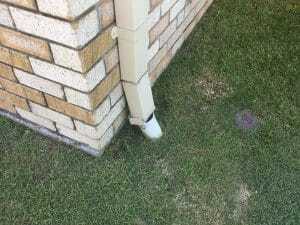 Drainage and pre purchase building and pest inspections. As far as your drainage is concerned make sure you repair any damage downpipes and make sure you have adequate field drainage . It is all about moisture around your home if you keep it dry it is very unlikely the termites will turn up. Timber structures in contact with the Ground. This is another common find during pre purchase building and pest inspections is timber structures in contact with the ground and house. The most common ones are decking and pergolas. The building code states that these structures must have a minimum clearance of 75mm off the ground. This is generally achieved by using stirrups to keep the timber off the ground. Other Types of Timber supports to keep Decking off the ground. The picture below shows the type used for decking or piers for a house . This also allows for the Termite inspection underneath the decking. You must have these areas to inspect to get certification for any additions to your home. The picture below shows stairs in contact with the ground. They should be clear of the ground . They could have used stirrups or set the stairs on concrete with an ant cap .We class this as a risk area for termites to access the house undetected. 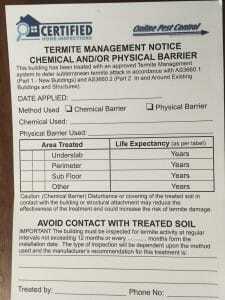 Termite protection Keep it up to date. This is one of the first things we check during the inspection is that your termite management systems (termite Barriers) are up to date and have been inspected regularly. If you can keep all records of these with your inspections as this will show the purchaser you have kept things currant and potentially save any hassles in regards to the termite protection. We find in many cases people will make it a condition of sale that all systems be up to date. So to summarise what we like to see during a pre purchase building and pest inspection. Keep Moisture away from the home , fix any leaks , make sure drainage is adequate , connect all overflows to the drainage system. The inspection zone must be clear . Remove any gardens , don't keep sheds , water tanks against the house and definitely don't store timber against the house . When putting in new pathways make sure you have your minimum clearance of 75mm or keep the inspection zone clear. Timber structures must be clear of the ground and house so termites cannot enter. Make sure your barriers are up to date and get inspected at least once a year. To book your building and pest inspection give Vicki or Lauren a call on. 07 32008585 They will answer any questions you have.